Muslims believe that the Word of God has always existed eternally in heaven. Known as Loh-E-Mahfuz, it is the unchanging, divine, uncreated word of God. Then Allah sent it down as a revelation to mankind. That is how the eternal word from heaven became the Quran on earth for man. It was written down in human words and printed on paper so that man can see it, touch it, revere it, read it and understand the Mus’haf. What was heavenly became earthly when it was confined on to the pages of a book. What was divine, came among humans so that humans can receive it and perceive the words of God. If it remained in heaven, man would never be able to know the word of God. So it had to to be sent. Even though it looked like any other book, it was God’s book. According to the Quran, Jesus is known as Kalimatullah (Sura 3:45, 4;171) . Kalimatullah means WORD OF GOD. The Bible says Jesus is The Word. (John 1:1-3). Muslims argue that all prophets and messengers speak the word of God. That is true but none of the other prophets or messengers were given the title “Kalimatullah.” Only Jesus. Jesus is the Word of God. He didn’t just speak the word of God. He is the pre-existent Word of God. This Word of God was sent down to earth. The Word became flesh. 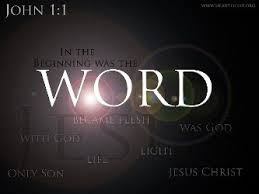 (John 1:14). The divine became a man just like us so that we can see him, touch him, revere him and understand him. “We proclaim to you the one who existed from the beginning, whom we have heard and seen. We saw him with our own eyes and touched him with our own hands. He is the Word of life. This one who is life itself was revealed to us, and we have seen him. And now we testify and proclaim to you that he is the one who is eternal life. He was with the Father, and then he was revealed to us. We proclaim to you what we ourselves have actually seen and heard (1 John 1:1-3). What was divine, came down among earthly humans so that humans can know him and receive him. If he had remained in heaven, we would never be able to know Jesus, Kalimatullah, the Word of God fully and completely. Jesus himself said that he has come down from heaven. (John 3:13). No one else have ever dared to claim this. Muslims can believe that the eternal and divine word of God came from heaven down to earth, was incarnated in human language, for man to recite, and confined to the pages of an earthly book. But they cannot believe that the eternal and divine Word of God, Jesus, came down from heaven, incarnated in human form, and was confined in an earthly human body of flesh and blood.